Can you ever have too much perfume? The new Gabrielle Chanel perfume was only released earlier this month and with one cheeky spritz from the Chanel beauty rep, again I Coco's! - This seems to be a long lasting powerful scent, with notes of jasmine and orange blossom, this glass bottle of liquid gold is firmly on top of September wish-list. I am obsessed with these classic shoes, by the iconic fashion house Gucci. Dividing my love equally between the soft floral 'New Flora' design and the classic black leather 'Princetown leather slipper' (with floral applique) Hope to one day add a pair to my collection. Which is your favourite Princetown design? In September I made the upgrade from my 2014 Mac (hubby spent a lot of time using) to a 2017 Macbook, in gold. I am over the rose gold options and when that fateful day comes to upgrade my other Apple gadgets (iPhone x anyone?) I will be going with the classic Gold design. Such a lovely lightweight compact laptop and with the cooler weather coming, we can grab our laptops and walk to the coffee shop to work on our posts. I just cannot get enough of Gucci and is definitely my luxury brand of choice right now! The classic supreme zip around wallet, matched so perfectly with my GG Supreme Large Top-Handle Bag that I had to get the set matching wallet, didn't I? I splurged on this beauty at the beginning of the month and although not overly fancy, the vintage utilitarian design set my pulse racing. Still obsessed with all things spider web, skulls and snakes, my style not really to different from my spooky teenage self! These stunning delicate gold Charlotte Olympia web earrings, make my heart flutter - The earrings are sold out on the web but I need these little gems in my life!!! Anyone know where I can get these? When I got the Sephora ZOEVA launch email, I knew that the makeup brushes (online exclusives here in the UAE) had to be mine! The full Rose Golden brush set not only eye candy but are also really high-quality brushes. Please keep your eyes peeled for my Zoeva brush review coming soon. From my recent Fenty beauty review you will know that the Match Stix's are a gem of the collection. Marketed as highlighter, I would say these are pretty much multi-purpose and can be used as a lipstick, blush and eyeshadow - I picked up both the 'Confetti' (an iridescent opal) and 'Starstruck' (an iced-out pearl shade) - no doubt it won't be long before unicorn (an intense platinum lilac) and Yacht Lyfe (a glimmering peach pink) make a way into my collection. 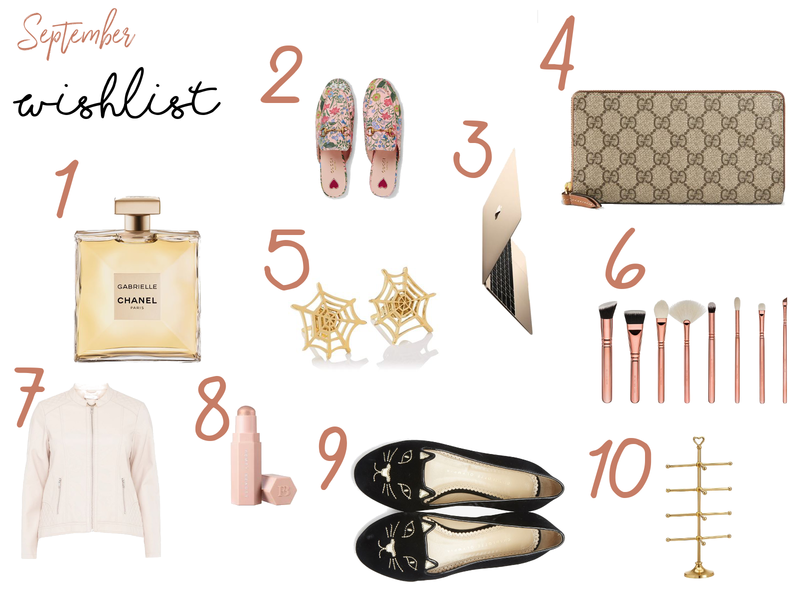 A cult favourite the famous Charlotte Olympia kitty flats have always appeared on my wishlist in one form or another! Earlier this month, being the bargain hunter I am I was very lucky to find a stunning fuchsia pair for less than half the price, in the newly opened outlet village in Dubai. These shoes are very comfortable and do make a statement, you would be surprised how many times I have been stopped just for my shoes to be admired. The tiny gold heel is a lovely accent and the secret spiderweb emblem is a lovely touch. Still a teenager at heart, when we stumbled across the Pottery barn teen shop in Yas Mall I was heaven! With the whimsical vintage-inspired collection from its gold shelving units, bunny lamps Parisian scalloped bedding of hearts and polka dots, I instantly fell in love with this gorgeous collection from the talented duo Emily and Meritt and hope to add more of the range into our Dubai apartment design.